The Fund 2040 Proposal drafted by the Chicago Metropolitan Agency for Planning (CMAP) outlines the need “to support prioritized infrastructure investments that help the region meet its goals for quality of life and economic prosperity.” Learn more about this ambitious plan at a noontime presentation, “Presenting the Fund 2040 Proposal,” Wednesday, February 18 featuring CMAP Principal Planner Erin Aleman. The presentation will run from noon to 1:30 pm at the Great Cities Institute, CUPPA Hall, 412 S. Peoria St., Suite 400, Chicago, IL. 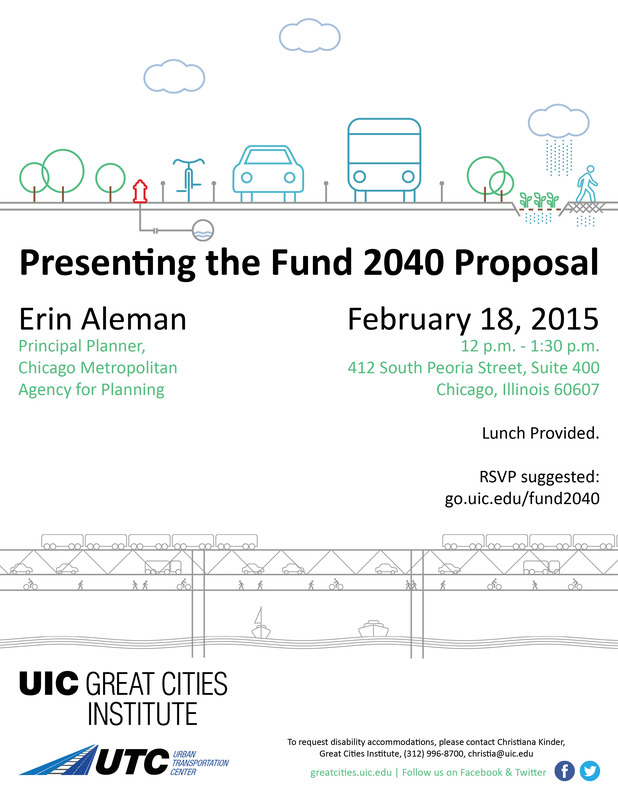 Lunch will be provided, and guests are asked to RSVP at: go.uic.edu/fund2040. This event is co-sponsored by the Great Cities Institute and Urban Transportation Center at UIC. Call 312-996-8700 with questions.